Food Grade Lard, Water, Aloe, Lye & Oatmeal. Clears up pimples fast Reduces red marks Doesn't make skin dry None My mom recently bought me this product and I love it. I have struggled with my acne for years. I started using Proactiv last year and it worked great at first, but then it started wearing off. Proactiv also started bleaching my towels. If that product is bleaching my towels, imagine what it is doing to your face. 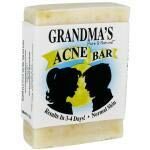 Anyways, I saw results from Grandma's acne bar in just a few days! I havent had a pimple since and my red spot have begun to diminish. I will say that I have had more blackheads pop to the surface, but I assume that this is from the formula cleaning everything out. I highly recommend this product! -dries out pustules to the point that they fall off almost instantly -destroys red marks -calms irritation -almost a miracle product! None! I LOVE THIS SOAP. I started using it on my back (moderate on m shoulders, light/moderate everywhere else), and it started working the first time i used it. My mom got it for me at Ace Hardware, of all places! Its a miracle, honestly, it just feels amazing. TRY IT, AND YOU WON'T REGRET IT!